I have noticed that I really love smileys! They just make the world a better place. And they make me happy, of course. This semester Jordan and I are super busy! And I mean super busy! We see each other on Sunday. That's basically it. We don't get to visit through out the day on campus. We work at different times. We study at different times. We sleep at different times. But everyday when I'm walking from class to class you can bet your wallet I get a sweet simple little text from my honey pie and at the end a smiley. :) It just makes my day. It can mean so many different things in its context and it just makes me think of "the many smiles of Jordan." So there you have it folks. 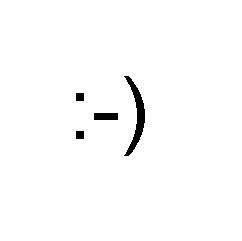 Go shoot a smiley at someone or if you receive one give it right back to them!